I already wrote up my impressions of Southwest founder Herb Kelleher’s “Celebration of Life,” but I still haven’t written up my flights out to Dallas and back home. While the flight out was fine, the return was… less enjoyable. I figured if I was going into Dallas, I’d take the opportunity to pack in as much as possible in a short time. That meant I’d take the first flight out in the morning on Monday from LAX. I checked in right at 24 hours and got the abnormally good A41 boarding pass. Slightly fearing that there might be security delays thanks to the government shutdown, I left home a little early at 545a. There was no traffic (it was MLK Day) and I was on the shuttle from QuikPark and in the terminal before 630a. There was a short line for the regular people, but since I had Pre Check, my line was almost non-existent. Once through, I headed over to the gate and looked for a seat. It was pretty crowded at the gate, and the big retail area took away what could have been more seating. I did eventually find a seat, and I almost fell asleep waiting for boarding to begin. We boarded N737JW (the JW is for Jim Wimberly, former Chief Operating Officer for the airline), and I was pleased to see seat 3A open and waiting for me. We pushed back on time and headed into the clear blue sky. It turns out it was a clear, bumpy, blue sky and the flight attendants were kept seated for the first 45 minutes. They then got up, but it got bumpy again and they were told to sit back down. They finally had enough time to finish drink service somewhere over West Texas, I believe. We had a brief smooth ride from there, and I spent the time just watching the map. I did notice that they are really promoting that all entertainment is free. Since internet isn’t free, I assume that means it doesn’t count as entertainment. But I could imagine that being confusing to some. We descended into Dallas on a mostly sunny but windy and again slightly bumpy day, and I found myself sitting on the wrong side of the airplane. We headed northeast of the airport before turning south, then back west, and then came in on final. Sitting on the left side, I saw nothing but farms and suburbs until the very end. We landed and had a very short taxi to the gate. It’s been a long time since I’ve been to Love Field, and I had forgotten just how easy that place is. I was at the curb very quickly, and it was a busy 24 hours. After Herb’s celebration, I headed straight back to the airport and arrived with a little over an hour before departure. It was a gray and drizzly day outside, but on the inside it was nice and quiet. The ticketing area was pretty empty. The security line was a ghost town. Once on the other side, I went to my gate and waited. We boarded and I saw this was one of the old 737-800 configurations with the weird half bulkhead at the front. I walked back and took seat 11A, skipping row 10 and its terrible windowlessness. I almost kept going since my row was a complete mess, but I didn’t. I’m guessing there must have been some kids in this row on the previous flight. The captain came on and said they’d just flown in from LA and it was a bumpy ride, so the flight attendants would remain seated for awhile. We took off into the murk, but we were above the clouds fairly quickly. The bumps hung around for about half an hour. Then the flight attendants were allowed up to begin service. Wifi wasn’t working (at one point they tried to restart the system). I decided to browse movies, and quickly settled on one. I wanted to have a little Wild Turkey to salute Herb on my way home. Unfortunately that didn’t happen. The flight attendants came through with drink orders, but skipped my row. The guy on the aisle was sleeping, and the middle was empty. I was watching a movie, so I’ll give them the benefit of the doubt that they just mistakenly thought I was asleep as well. I don’t really know. So when they came back through with snacks, I spoke up. Me: Did I miss drinks? Flight Attendant: You must have. If you snooze you lose. That’s when I stopped myself knowing it wasn’t going to help things. Instead, I just asked if they would mind coming back to take my drink order after snacks were done. The one flight attendant said she would. She never did. She did walk by quickly on a trash run, and I thought about stopping her. I also thought about ringing the call button. But I feel conflicted when I’m traveling on a pass provided by the airline. I don’t want to start any trouble, so I just sat there hoping they’d do a second drink pass. They did not. Instead, she came back and stood with her back to me for probably 15+ minutes talking to someone in the row behind. I got the feeling there were several employees on this flight who had come out for Herb’s celebration and were heading back home. I resigned myself to a drink-less flight and just watched my movie. After the wifi reboot, I was nervous that I wasn’t going to catch the end of the film. It didn’t help that I kept getting disconnected about every 30 minutes so I had to reconnect. When we crossed over the Colorado River, sun reflecting off its winding banks, I knew it was going to be tight. Soon, the captain announced we had begun our initial descent. The flight attendants came on right after with their “final approach” spiel, telling everyone to put tray tables up, seatbacks, etc. I chose to ignore them so I could try to see the end of the movie. Besides, we were really just on the initial descent anyway. When they walked through the first time, they didn’t make me put my laptop away, so I breathed a sigh of relief. The movie finished as we descended over the Inland Empire, and I buttoned up. I was surprised to see us land on the south runways, but it didn’t matter. We were early and our gate was occupied. We sat on a taxiway near the Bradley Terminal for maybe about 10 minutes. (I wasn’t really counting.) The gate freed up, and we still arrived several minutes early. Back on the ground, I waded through the terminal, grabbed a long-needed drink of water, and made the smart move of walking back to Quikpark. That took less than 10 minutes, easily beating the shuttle which would have slowly wound its way around the horseshoe. I headed home in bad traffic. Fortunately, Waze took me on side roads, and when I passed a liquor store, I stopped and grabbed a bottle of Wild Turkey. I might not have been able to toast Herb onboard, but I would certainly do it that night. Which was a new one for me, I asked the flight attendants and apparently it’s a new term that means grab an open seat or pop a squat in the aisle NOW. Have you heard anything about that? Is there a where I could find out more about these kinds of terms? A_B – I assume that if safety is an issue, they’ll do anything they can to prevent injury. If that means imminent expected turbulence, then get those flight attendants seated and protected where they can’t be injured. I’m not sure that this is a set procedure but rather just a reaction to the conditions. Well, the attendant said it was a new term United had just introduced. I was curious if that was an industry standard or if the lingo varies by carrier. Cranky is exactly right. Any time the Captain says to be seated, FAs take their jumpseats. When “immediately” is tacked on, it means sit down and secure yourself now, wherever you can…even if that means in the cabin on a passenger, which I’ve had to do before. Talk about the friendly skies eh? That must be awkward. I believe the emphasis on the free entertainment is that movies are now free and this is a recent change. It used to just be free tv & movies were like $5. Its a change I’m excited for & tip my cap to Delta for being the leader and likely forcing other airlines to adopt as well. mipo777 – Absolutely that’s the emphasis. I just wonder if it confuses some who might think it means internet is free. Fun fact about Gate 5 at DAL: its near the spot where Air Force One was parked on the afternoon of November 22, 1963, making it the site of a presidential inauguration – the only one ever to occur west of the Mississippi, and one of the few that’s ever happened outside DC. There’s a plaque on the tarmac on/near the exact spot which can be seen (barely) from the boarding area windows. What some people will do to get a bottle of Wild Turkey! Well… what do you expect – Brett is one & we all like him that way! BTW What was the unnamed movie on the return flight? Just curious. SEAN – Oh it was in the image if you looked closely! Crazy Rich Asians. Sorry Brett, but I’m legally blind – there’s no way I would see that. Sean, I have good (for middle age) vision and I didn’t even notice the movie title when reading this on my large phone. Only when I re-read the post on my 15″ laptop could I see there was a movie title. SEAN – Well I’m always happy to respond for those who can’t see. Anyway, it was pretty good, I thought. I thought about asking the flight attendants for “A Wild Turkey for me, and another one for Herb” on my Southwest flights a few weeks ago, but decided it was better not to mess up my sleep that evening, especially as I had an hour drive to my destination after the flight landed at midnight (the whiskey wouldn’t have put me over the limit, but because already being tired, it definitely would not have helped my driving skills). Instead I chose to just buy a liter of Wild Turkey the next time I saw it at the store, and toasted Herb a week later . Not my favorite bourbon in terms of flavor or smoothness, even given the price, but not as rough as I was expecting or led to believe, with better flavor than some whiskeys I’ve had. The indifferent flight attendant befuddles me. These folks are the face of the airline and if they provide poor or indifferent service, at it appears your flight attendant did, then it reflects negatively on a guest’s willingness to fly the airline again. That makes raises and incentive compensation hard to come by. United still has some of the same problem. I suspect they all do to one degree or another. But the flight attendants are the face of the airline and they should know better. Especially at Southwest! Back when we actually had *REAL* choices and *REAL* competition (not the oligopoly of today), that would’ve certainly been true. A rude F/A makes you not want to fly Southwest. So you go to Delta. No better. Meanwhile, someone else swore off the same haulers and for the same reason. Round and round, dozey-doe. Back and forth we all go. The airlines know this. They have little to no incentive to provide a good experience because there really aren’t any meaningful choices left and also that there’s no way in hell *YOU* are about to encumber a little inconvenience and sacrifice your 1500 mile trips to lay on the beach just out of principle. Come on. Let’s be realistic about all this. That goes double if you’re in a fortress hub of some kind, like I am at EWR. There’s basically nothing that could happen that would realistically get me to stop flying United, no matter how upset about it I am. The other alternatives just don’t get it done. Shame we don’t have high speed rail. I think you should report the F/A who said “If you snooze you lose.” I think that is a very bad attitude toward the passenger. I don’t really mind WN for what they are but on longer flights I despise their refreshment service. Last year I flew WN for about 6 segments and for every-single-one they were MORE expensive but had a better schedule for my needs. The boarding and pick your own seat thing doesn’t bother me but the fact that I’m lucky to get a 4oz cup of water on a 2+ hour flight is beyond ridiculous. By comparison I flew DL today on a 2.5 hour flight and the flight attendants went through no less than 4x offering water & coffee AFTER the initial beverage service. Bottled water is cheap and it’s not a big ask to keep the pax hydrated. LUV the way you ended this trip report. Thanks for taking us along for the ride. Cranky—that looks like a Surface Pro. FWIW, you could easily fold back the keyboard behind it, at which point it’s no longer viewed as a computer, but rather a handheld tablet that you can hold through landing. This way you wouldn’t have to worry about getting through your movie. I do this with my iPad Pro all the time; when landing starts, I fold it back and use it as a tablet for the rest of the flight. BigDaddyJ – Nope, it’s a Surface Laptop, so it doesn’t bend that way, I’m afraid. I am a flight attendant for SW. I am sure if you would have asked again, she would have apologized profusely and brought you a drink. It was a sad day for many employees and on top of that, sometimes we have 4 or 5 requests when we are walking down the aisle and we just honestly forget. It its not a slight. As for the drink order, you had headphones on and you were looking down. I doubt she literally meant you were sleeping with the “snooze” comment, but besides jumping on you or shaking you, it is hard to get someones attention who cannot hear or see you. Sorry you interpreted it as a slight. I totally agree with SWStew. It is hard to get passenger’s attention when they are engrossed in their movies. I know when I am on a plane and wearing my headphones, I can’t hear anything but my movie. That is why I buy the good headphones. When flights are bumpy and the flight attendants are up and down a lot, that is for their safety, they can forget things. All you had to do was say excuse me, may I get my drink? I am sure that flight attendant would have apologized for forgetting and gotten you what you asked for. Feel free to empower yourself and get their attention. You sitting there a whole flight thirsty, is ridiculous on your end. If you choose not to do something about it, I think it is terrible that you then complain about it later. Shame on you. Especially if the flight attendant was standing chatting the next flight back. It would have been easy to get her attention. I think we found the flight attendant! I hope you enjoyed the Wild Turkey. I’m flying on SW now, direct between Tampa and Minneapolis. We have a short stop at Atlanta but remain on the same plane to MSP. Thought you’d like to hear this info as I read on your blog about SW and their new market to HI. As an idea for a good post for Cranky, it would be interesting to read an article or interview describing the process of an airline like Southwest getting ETOPS certifications for new routes and/or new planes, as I’d be curious what’s involved from a planning and technical side to make sure that every base is covered. I know Southwest is at the very tail end of the ETOPS certification for the planned Hawaii service, hence the announcement by the FAs. So did John Bogle of the Vanguard mutual fund organization. Sorry you had a crappy SW flt. I’m one of those nice old sky hags who likes my all my pax to leave happy. if a pax tells me- he didn’t get an order or was skipped-I apologize and bring the pax a snack…and comp the Wild Turkey. I’m getting ready to retire……HK is gone…welcome to the “new” SWA. I was a passenger on this flight. This was NOT a crappy flight… this crew did a GREAT job! Yes, the wifi did not work. Yes, it was bumpy with intermittent service because of the weather. So I can see how a flight attendant would have forgotten something. I found them very professional as they came through the cabin many times. I fly SWA a LOT! I do recall that day was special and sad all at the same time. 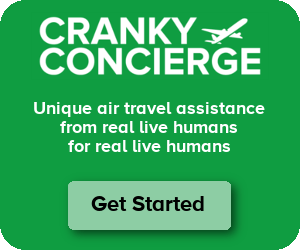 I think Cranky Flyer is being a bit harsh on the flight crew. There’s a parking lot at LAX that’s walkable? Who knew? Definitely needed. You can spend an hour on the loop. KevinL – There are closer ones than that. Park ‘n Fly is right next to Terminal 1 if you want that. But otherwise it’s easy to cross Sepulveda and walk to nearby parking lots along Century, at least from Terminal 1. I have done the LAX Terminal 3 to parking lot C walk, late one night; but I thought there were portions with no sidewalks. Thanks. klouche – If you walk on the arrivals level, you can cross Sepulveda and have a sidewalk that whole way. The sidewalk continues on Century if you keep going east, but if you turned on Sepulveda, I’m not sure if the sidewalk ended for some construction areas. It should be ok again, I think. But you could also just go east to the next street and avoid Sepulveda.